As described on the page on Twelfthnight, this Feast -- also known as the . 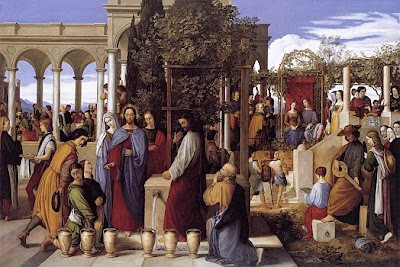 "Theophany" or "Three Kings Day" -- recalls Christ revealing Himself as Divine in three different ways: to the Magi, at His Baptism, and with His miracle at the wedding feast at Cana. For families who practice traditions involving "the Magi" or "La Befana" leaving gifts for children, the day begins with the wee ones discovering what was left for them while they slept on Twelfth Night. At today's Mass, there will be a blessing of gold, frankincense, myrrh, Epiphany Water, and, after Communion, a blessing of chalk. Bring small special items of gold to have with you during the Mass, and they will be blessed if they are exposed as you sit in your pew with them (wedding rings, rosaries, an heirloom piece of gold jewelry, for example). Peace be to this house. And to all who dwell herein. From the east came the Magi to Bethlehem to adore the Lord; and opening their treasures they offered precious gifts: gold for the great King, incense for the true God, and myrrh in symbol of His burial. My soul doth magnify the Lord, and my spirit hath rejoiced in God my Savior. For He hath regarded the humility of His handmaiden. For behold, from henceforth all generations shall call me blessed. For He that is mighty hath done great things to me, and holy is His Name. And His Mercy is from generation unto generations upon them that fear Him. He hath shewed might in His arm, He hath scattered the proud in the conceit of their heart. He hath put down the mighty from their seat, and hath exalted the humble. He hath filled the hungry with good things, and the rich He hath sent empty away. He hath received Israel, His servant, being mindful of His mercy. As He spoke to our Fathers, Abraham and His seed forever. Be enlightened, be enlightened, O Jerusalem, for thy light is come, and the glory of the Lord is risen upon thee-- Jesus Christ born of the Virgin Mary. And the Gentiles shall walk in thy light and kings in the splendor of thy rising, and the glory of the Lord has risen upon thee. Let us pray. 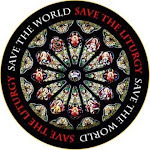 Bless, O Lord God almighty, this home, that in it there may be health, purity, the strength of victory, humility, goodness and mercy, the fulfillment of Thy law, the thanksgiving to God the Father and to the Son and to the Holy Spirit. And may this blessing remain upon this home and upon all who dwell herein. Through Christ our Lord. After the prayers of the blessing are recited, walk through the house and bless each room by sprinkling with Epiphany water and incensing it. with the "20 "being the millennium and century, the "C" standing for the first Wise Man, Caspar, the "M" standing for Melchior, the "B" standing for Balthasar, and the "05" standing for the decade and year. It is also popularly believed that the Kings' initials also stand for "Christus mansionem benedicat" ("Christ bless this house"). Note that some write the first Wise Man's name as "Gaspar," "Kasper," or "Jaspar," so the initials would be "G+M+B" or "K+M+B" or "J+M+B." In any case, these initials over our doorway serve to remind us of Who the Magi saw and how they saw Him. They remind us to adore Him as they did. The chalk markings remain over the door 'til Pentecost. It is a popular custom among some people that all who enter or re-enter their home for the first time after the blessing should step with their right foot across the threshold so as to start things off "on the right foot." It is customary in some religious orders to choose a new patron Saint today for the coming year. Families can do this, too, choosing a new Saint by designating someone (e.g., father or mother, etc.) to select the new Patron, by determing by lots who will select the new patron, by having family members write down their choices and choosing at random, by allowing the person to choose who presents the best argument for a particular Patron, etc. It would be very beneficial if the person who chooses teaches the rest of the family about that particular Patron, perhaps looking up the Saint in Butler's works, finding art work depicting the Saint, etc., and sharing it.